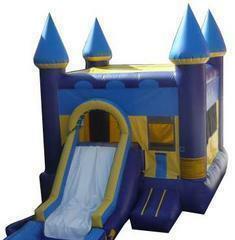 The blue castle combo bounce house comes with a basketball hoop and a slide on the front of the bounce house. This bounce house is great for any hot summer day for your kids to come outside and bounce and slide. This moonwalk also includes safety-step entrance/exit and 360-degree netting to make to make it easy to watch your kids.